I am all about taking care of my skin. I didn’t do such a good job of it when I was a teenager, because you know we think we are invincible, so now I am doing what I can to treat my skin good. 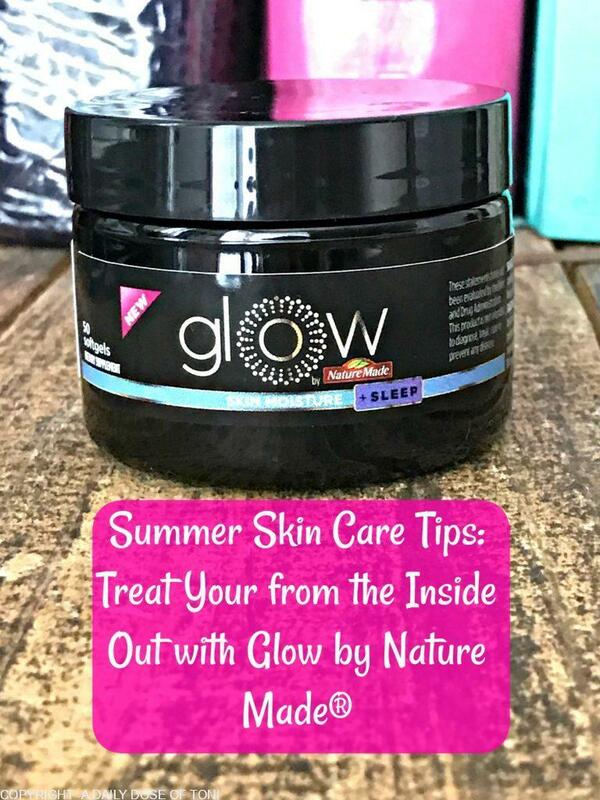 Recently I was introduced to a new product called Glow by Nature Made®. I was immediately intrigued because it says it works from the inside out! 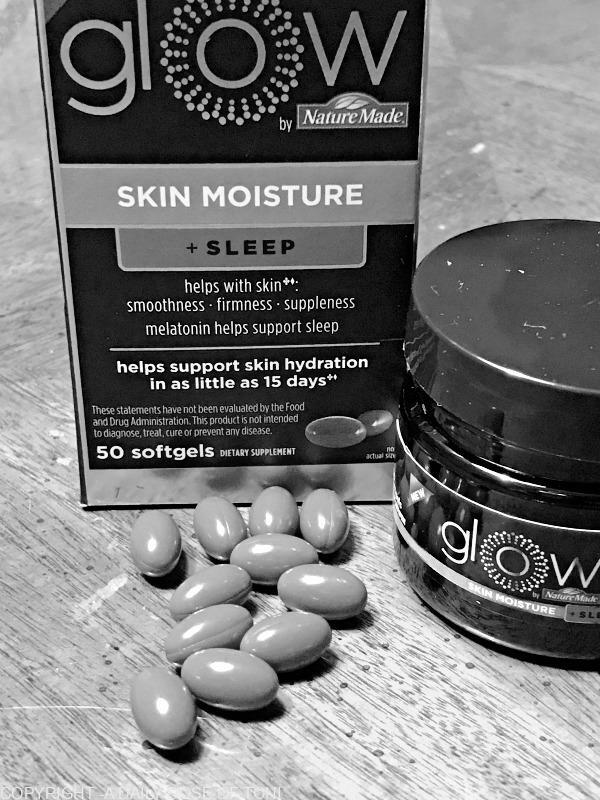 I headed to my local Walgreens to pick up a bottle of the Glow Skin Moisture + Sleep. As you can see it’s found in the vitamin aisle at Walgreen’s. After reading that it helps with skin** smoothness, firmness and suppleness and has melatonin to help aid in sleep I was excited to try it out. Before I tell you my thoughts on how it’s worked so far, let me share with you some of my summer skin care tips, because summer isn’t always the best to our skin, so we need to take extra care! Tip 1: Start inside. Taking Glow by Nature Made® you are working from the inside out. It comes in 3 formulas: Glow Skin Moisture, Glow Skin Moisture + Hair and Nails, and Glow Skin Moisture + Sleep. You pick the formula that is right for you and watch as it works! Tip 2: Lather Up! We tend to be outside much more in the summer, then the cooler season, so it’s important to remember the sunscreen. Be sure to apply at least 15 minutes BEFORE going into the sun. Even in the colder months, you will want to use something with an SPF in it, to help keep aging signs to a minimum. Tip 3: Hydrate, Hydrate, Hydrate!! Water is key to healthy skin. If you aren’t adequately hydrated, your skin can show signs of aging because it doesn’t have the moisture that it needs! So be sure to get ample hydration through your day. (I need to get better at this if we are totally transparent). Tip 4: Go bare. Yes, we all love makeup, it’s fun, and the looks you can create are endless. However, wearing it every day isn’t ideal for our skin. Take a break from makeup, or at the very least just use a little powder and nothing else. Your skin will thank you for it! Tip 5: Get Sweaty! Sweat loosens the dirt in pores, so when you take that after workout shower, you are washing away the ick. You are getting fit and getting gross stuff out of your skin, that’s a win/win! Tip 6: Keep it clean! When you do wear makeup, be sure to take it off and cleanse your face from the makeup you’ve work and the pollution our skin comes into contact with on a daily basis. Our skin needs time to breathe and repair, and it can’t do that if you aren’t taking everything off to let it! So, those are some of my tips for keeping your skin looking and feeling great! Now, how do I feel about the Glow Skin Moisture + Sleep? I love it, so far! 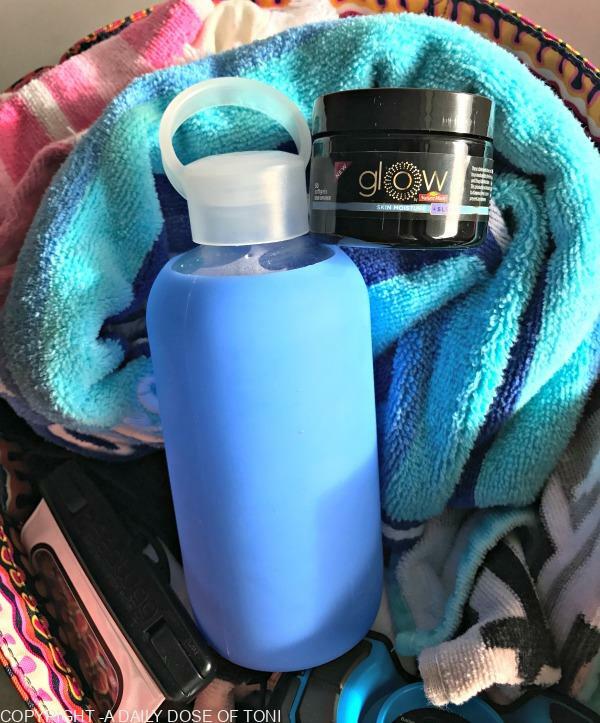 I have been using it for about a month, and I am not even kidding when I say I feel like I am “glowing.” My skin just seems like it is just a little bit different. The ceramide in Glow really helps retain skin’s moisture on the inside, which helps with smoothness and healthy looking skin on the outside. Plus the melatonin has been helping me sleep more soundly. 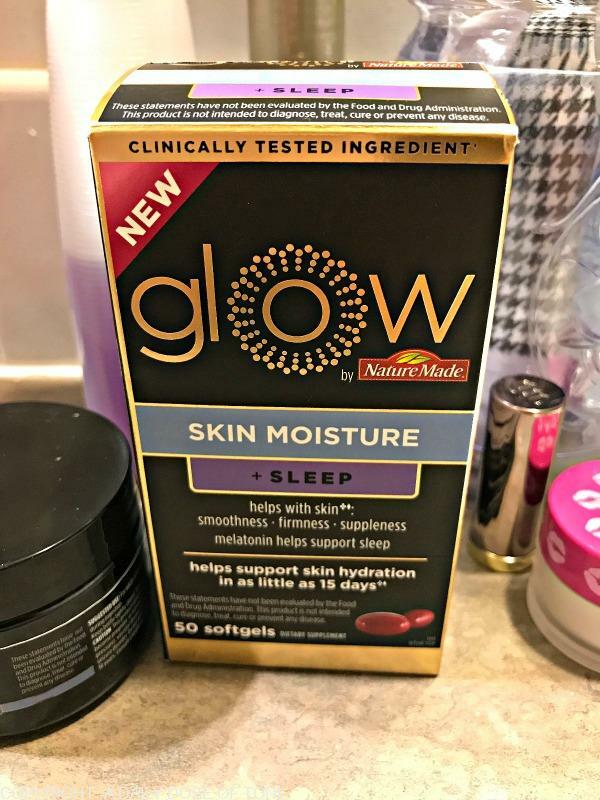 I am super impressed with Glow Skin Moisture + Sleep by Nature Made® and can’t wait to see how my skin does as I continue taking it! 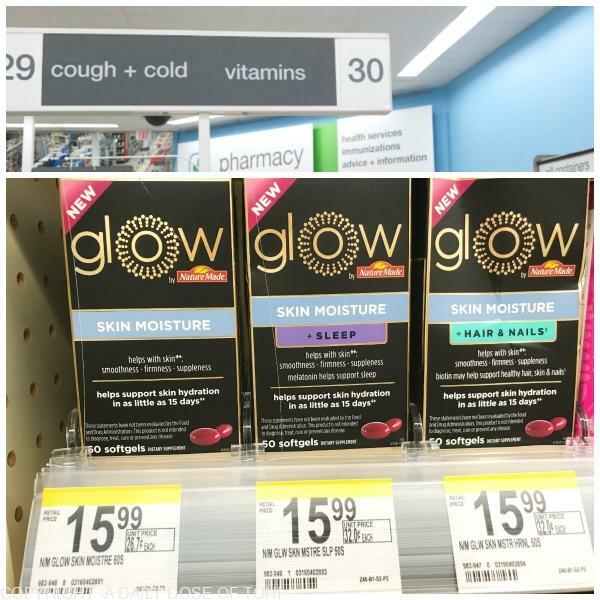 If you are ready to try out any of the formulas of Glow by Nature Made® be sure to head to your local Walgreen’s supplement aisle and pick up a bottle! Try it out and then let me know how you liked it! I was asked by Carusele to participate in the Glow by Nature Made® #MoisturizeFromWithin campaign, sponsored by Walgreens. Although I have been compensated, all opinions are my own.